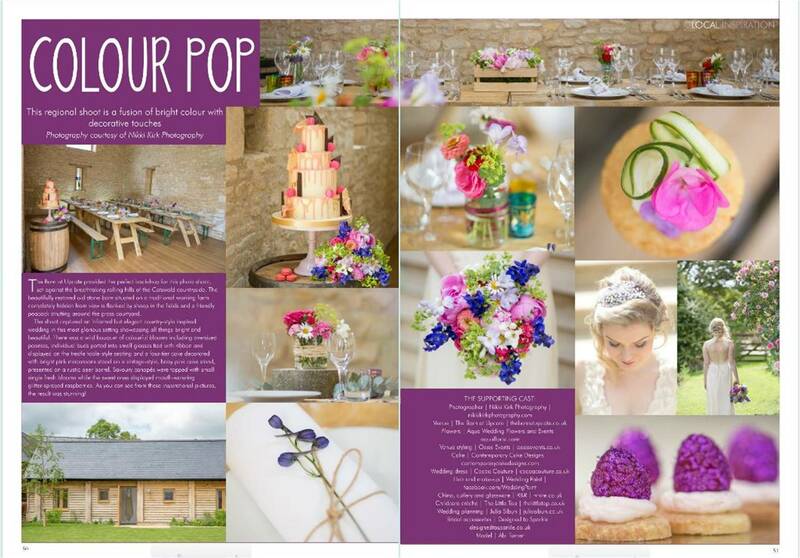 We are delighted to see this on trend shoot at The Barn at Upcote in the new edition of Your Glos & Wilts Wedding Magazine! Don’t forget its the Wedding Fayre this Sunday from 11.00 – 16.00 at The Barn at Upcote too – hope to see you there. Featuring the fabulous Abi Taylor with AQUA wedding flowers and events, Oasis Events Ltd, Contemporary Cake Designs, Cocoa Couture, Wedding paint, Posy & Pearl, Julia Sibun, The little top, Designed to Sparkle, Brillare, Love Bites Events, R&R Catering Hire Ltd. Check out our blog on this photo shoot – the first shoot for the Barn at Upcote.